The Stayman Winesap apple tree can’t be pollinated with other varieties of apples to get better results. This is a triploid. The apples are large, mostly cone shaped, red with green or yellow shades. The flowers are usually pink. 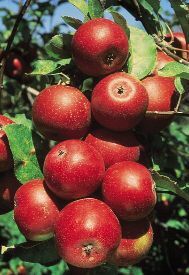 The plant is recommended to keep to the winter to experience a wine like flavour in these apples. They also develop tart, but it’s a rich tart. They make excellent ingredients for cooking, baking and cider. They are harvested in the second half of October. A Stayman Winesap apple tree needs a square of 35 feet each side for a healthy growing up. That means they acquire more area in comparison to their height at maturity i.e. ten feet. They need moist soil (neither more nor less water) and very sensitive to dried water. Natural manures are the best for fruiting season. The semi dwarf and dwarf breeds are prone to breaking down due to the weight of the fruits they bear. So they need to be provided with hedges for support. The Stayman Winesap apple is treated as high quality dessert apple. It makes one of the major components of the gift baskets due to its wine like flavour. It can be stored for a longer duration than any other breed of apples. They are mostly planted in the spring so that the environmental temperature will be for primary growth of the plant. The plant needs direct sunlight for six to eight hours a day. Availability of sharp sunlight in the summer days makes the plant store its food at a rapid rate and hence the fruits attain maturity towards mid October. If the fruits are plucked before ripening, they could be used for making pies and can be stored in freezers. The Stayman Winesap Apple Tree survives well in both temperate and warm climates.